I have just returned from the Sensing the Past conference in Frankfurt on remote sensing in archaeology. It was the final conference for the ArchaeoLandscapes Europe project (ArcLand), which has been running for five years under the directorship of Axel Posluschny of the Roman-Germanic Commission. ArcLand’s main aim was to create a European network between users of remote sensing methods in archaeology and to encourage the wider take-up of and training in said methods. As the conference revealed, in this context remote sensing means a mixture of different non-invasive prospection methods, including LiDAR, geophysics, aerial photography, hyper-spectral imaging, and some satellite imaging. The conference itself was very engaging intellectually. I was particularly taken with two elements: the work of Michael Doneus and his team on the latest prospection methods (particularly hyper-spectral imaging, which has the potential to be the next great breakthrough); and the work of Kevin Barton with community groups in Ireland, where low-cost aerial imaging has the potential to open up community engagement with archaeology in a country where you need a license to undertake almost any other type of archaeological work. Another fun paper was given by Gabor Bertok which included the successful usage of data collected by GPS-enabled combine harvesters for archaeological prospection (which would be of limited applicability for archaeology, but potentially immensely useful for reconstructing past river channels across wide landscapes)! Amongst the most useful achievements of ArcLand partners has been the creation of two toolboxes for processing LiDAR data: Ralf Hesse’s LiDAR Visualization Toolbox (LiVT) and Žiga Kokalj’s Relief Visualization Toolbox (RVT). By their own description, RVT is the more user-friendly and LiVT the more customizable when undertaking analyses. I shall certainly be experimenting with them more myself. In any event, overall the conference was very worthwhile and it is to be hoped that the brilliant work of the ArcLand network continues even as the funding comes to an end. In a previous post, I looked at how we might model some of the modern factors that affect the distribution of PAS finds. I termed these factors “affordances”, as they can be thought of as helping to govern the opportunity for metal detectorists (and others) to be able to discover archaeological material. I then began thinking about the affordances that affect the opportunity / likelihood of sites and monuments being discovered (if they were there to begin with in the past, of course). As clusters of spot finds. As documentary records (or place names, etc.). Via excavation / other intrusive field evaluation (e.g. watching briefs, test pits, etc.). Via aerial photography as crop marks. Via aerial photography as earthworks. To these could be added other routeways, such as LiDAR prospection, but these account for quite low percentages of sites and monuments at present. Of the affordances relating to these six possible discovery pathways, number 1 has been outlined in the post referred to above, number 2 is, I think, impossible to define / quantify, and number 4 is hard to define / quantify. Therefore, I have focused on numbers 3, 5, and 6. The main affordance in this category is where the opportunity to undertake archaeological excavation (etc.) exists or has existed. Ideally, this variable would be based on data not explicitly linked to archaeological investigation: i.e. planning decisions on major projects and small projects in sensitive areas (albeit sensitive areas brings in an archaeological element), but this data is very hard to discover and collate. In particular, planning statistics are inconsistently archived on the UK Government websites and changes in planning authority boundaries over time make collation particularly problematic. Although I feel that putting the effort into compiling this information (since 1990 ideally, i.e. post PPG16) would be worthwhile, it would be too great an amount of work to undertake for our current project and purposes. Affordance for excavation etc. : white is low, yellow medium, and red is high. The results look pretty convincing, with areas of well-known high amounts of fieldwork showing up in the reds (e.g. London, the Upper Thames, Peterborough, Cambridgeshire). As such, I am pretty happy with this result. Affordance for aerial photography: green is good for earthworks, orange for crop marks. Although there are some issues with this model, in particular the fact that cropmarks can appear on grazing land in dry years, the results look fairly robust. Although the model is clearly imperfect, the results do look intuitively correct, with the more archaeological dense areas of the country generally showing up in yellow and with clusters of high affordance around historic towns / cities. The lower affordance levels in the north west, around the Wash and across the Weald are genuinely (relatively) low areas of site / momument density in our database. Some areas of lower affordance can have higher densities of sites / monuments, which is particularly true of Bronze Age activity in upland areas (especially Dartmoor and the Peak District), but I do not think that this represents a problem. There will inevitably exist areas with low affordance but high densities of sites (and vice versa) and, in some ways, these are perhaps the areas of most interest (as they are the ones where we can say that there are definitely past high activity levels coming through rather than simply being due to intensity of investigation)? Ground obscuration taking into account woodland and human structures. Relevant to aerial photography generally. Soils that never show crop marks. 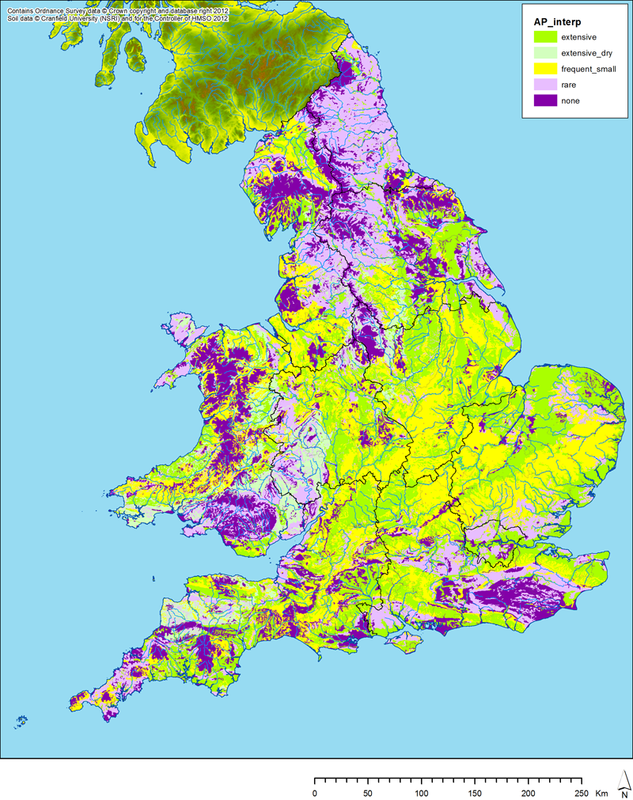 Soil types of England and Wales graded according to possibility of showing crop marks. After Evans 1990. Ground obscuration taking into account soil type, some sub-surface geology (peat / alluvium), woodland, and human structures. Relevant to crop marks. This latest map is only really relevant to crop marks, as presumably earthworks would still show even in the more unsuitable soils (under the right lighting / weather conditions). 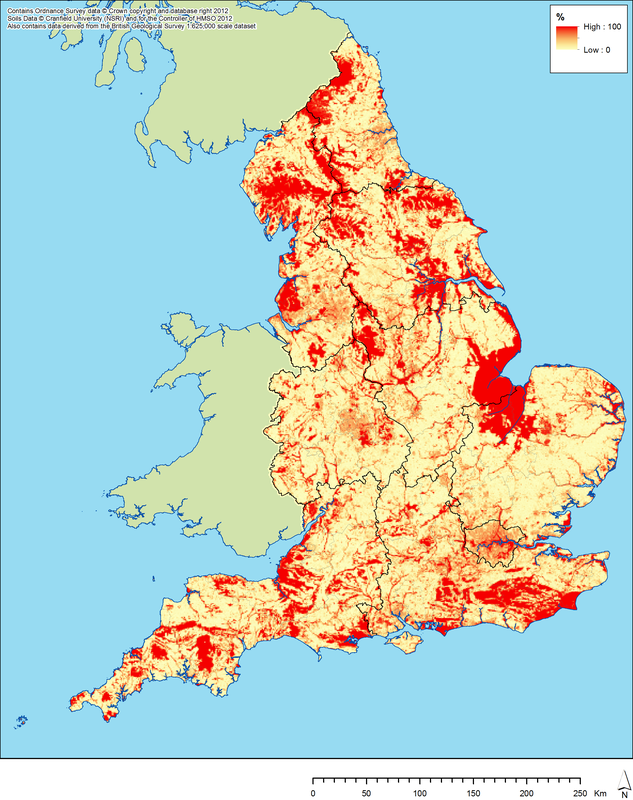 We can see, however, that large parts of England are not at all suitable for aerial prospection for crop marks. I am not sure that the large peaty areas seen in the east would necessarily mask all crop marks, but then all models are imperfect. It might be useful to include the “rare” crop mark soils in this map too, perhaps with a lower weighting to reflect their partial effect, but I decided to work for now on a stricter basis. NMP projects as of 2012 compared against ground obscuration (re. crop marks). 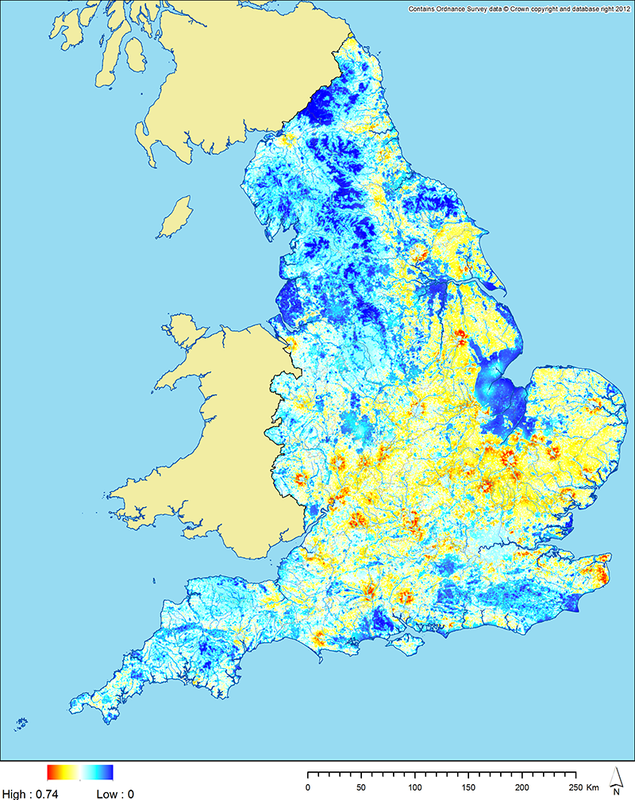 This shows a reasonably good correlation between areas in which NMP projects have been (or are being) undertaken and areas suitable for aerial prospection (for crop mark features). Where the NMP projects cover areas unsuitable for crop mark discovery, these tend to be upland areas where thin soils ought to mean earthworks are fairly prominent (I think). 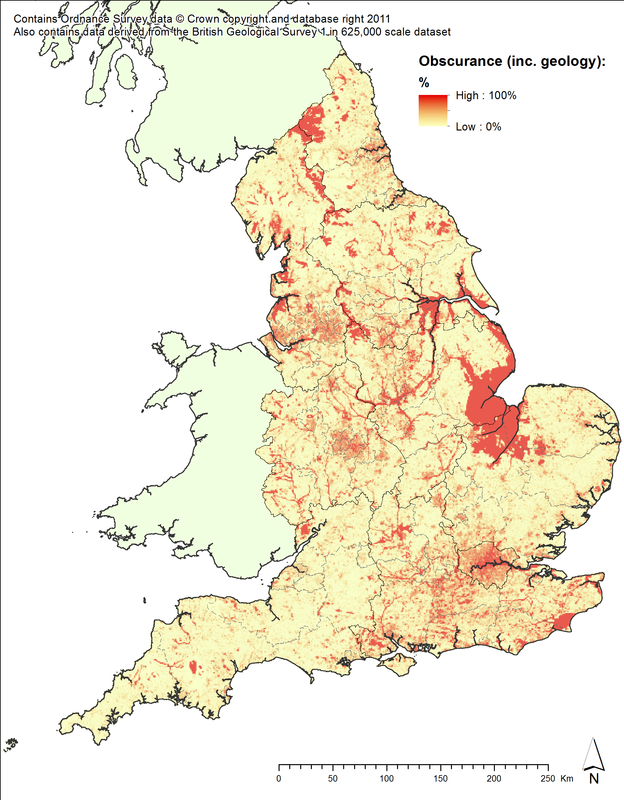 It also shows that although the NMP covers around 50% of England, much of the remaining 50% is not necessarily suitable for NMP type projects (as they are reliant on aerial photography), with the particular exception of the rural West Midlands and parts of East Anglia. However, many of these less suitable areas might be suitable for LiDAR survey. Further down the line, I will be comparing distributions of archaeological sites against these obscuration maps to see if I can discover any intrinsic biases towards areas suitable for aerial prospection within the data. Evans, R. 1990. “Crop patterns recorded on aerial photographs of England and Wales: their type, extent and agricultural implications.” Journal of Agricultural Science, Cambridge 115, 369-382. Examination of aerial photography is one of the primary methods by which archaeologists have surveyed the landscape of England for new sites and for new information about known sites, in a process that continues to this day. However, it is only possible to find buried archaeological features by this method under certain conditions. One particular adverse condition that halts all aerial photographic survey work is the obscuration of the ground surface by human and natural features. Woodlands / forests (LiDAR can see through these to some extent, but photography cannot), lakes, buildings, roads, railways, etc. can hide the ground surface and make the detection of surface and subsurface features impossible. As a result, distributions of archaeological sites discovered through aerial prospection will inevitably be biased towards areas of open country, particularly arable and pasture lands. If we wish to make quantitative statements about such distributions, we need a methodology by which to quantify the obscuration of the ground surface, in order to demonstrate which areas of apparent blankness on such a distribution map are, in fact, only blank due to the impossibility of aerial prospection. 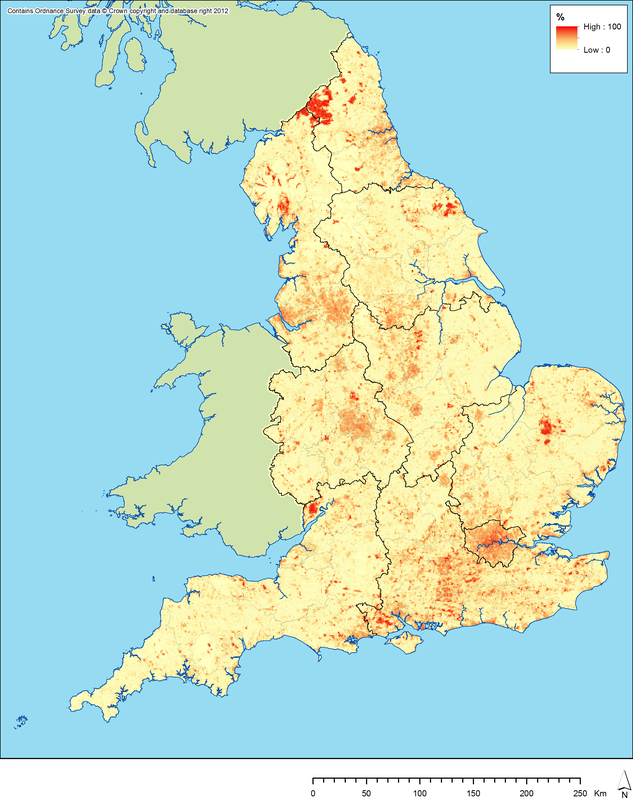 When the Ordnance Survey made available some of its data under its OpenData initiative, it became possible to undertake this quantification of obscuration using some quite simple (albeit intensive) computational methods. 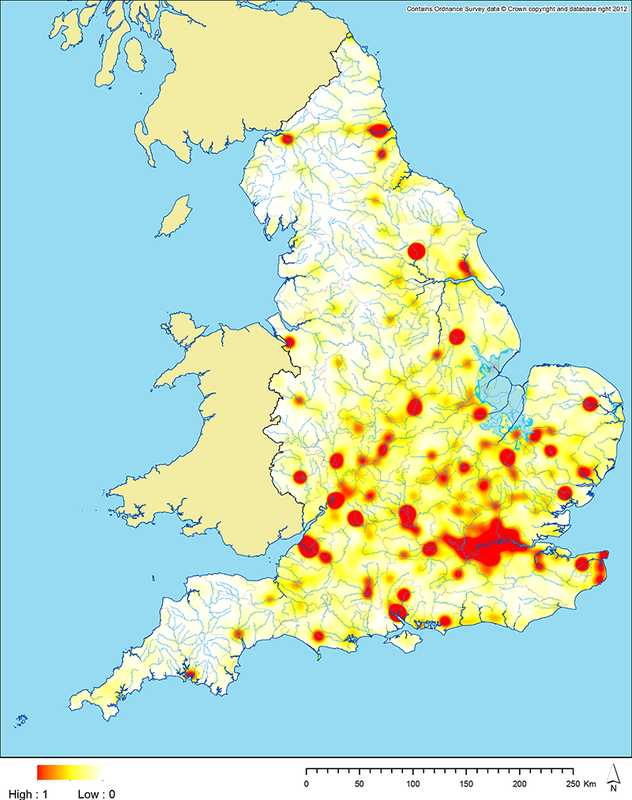 This is because the Vector Map product produced by the OS is organised thematically, making it quite simple to download and join together thematic map layers for the whole of the UK (as the current project is only concerned with England, the method discussed below has only been undertaken for England, however). This forms a series of data layers that would have been very difficult to pull together prior to the OpenData initiative. 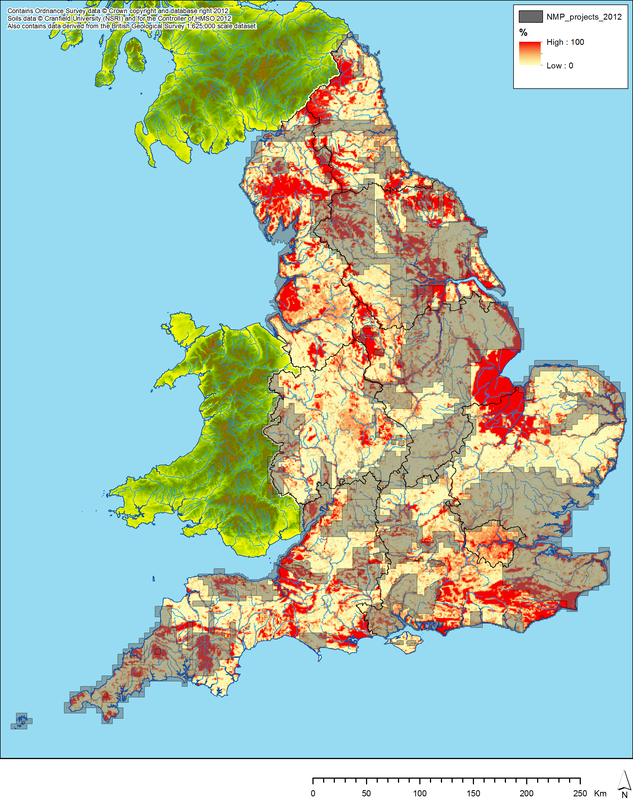 To build up a map of ground obscuration for England, the following OS OpenData layers were downloaded and joined together for several regions (European parliamentary constituencies) that together spanned the whole country*: buildings, water areas, forested areas (all polygons), roads, and railways (line data). It would have been possible to include other layers (such as glasshouses), but it was decided that those listed above were sufficient to produce a good generalised map. The spatial precision of these layers actually appears very good, especially for the resolution of analysis undertaken (see below). Buffers were generated for the roads and railway lines, of varying width depending on the type of entity (based on a quick survey of a few entities of each type on Google Earth): 10m for most types of road and for narrow gauge railways; 15m for A roads and single track railways; 20m for trunk roads; and 25m for motorways and multi track railways. The buffer layers, buildings, water areas and forest layers were then joined together using the union tool in ArcGIS to create a polygon map of ground obscuration for each region. 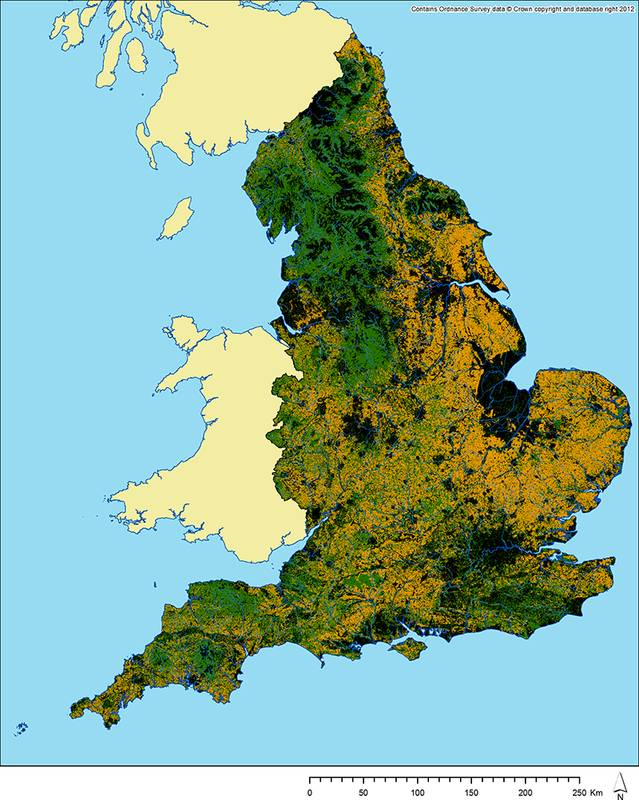 A 1km by 1km polygon grid square layer was generated using Geospatial Modelling Environment and then reduced down to the outline of England via a spatial overlap query. The identity tool in ArcGIS was then used to calculate how the polygons in the obscuration layers overlapped with the grid polygons, and the area of each resulting overlap polygon was then calculated. The attribute tables were exported for these output layers and joined together in Excel into one big table listing the ID number (CELLID) for the related grid square and the area of each obscuration polygon within that square. A python script was written which went through this table, adding together the total area of obscuration for each CELLID (this took around seven hours to process), and outputting a new table listing CELLID and total area of obscuration. Obviously, as with all models, this is not a perfect or perfected result, but I do believe that it provides a very useful quantification of the extent to which the ground surface of England is obscured to any aerial visual observer (the picture would be somewhat different for LiDAR prospection, as then I would not have included trees as a form of obscuration). There are undoubtedly other types of obscuration feature that could also have been included (areas of alluvium or peat, perhaps) and there may be some types of included feature that can, in certain circumstances, be seen through. 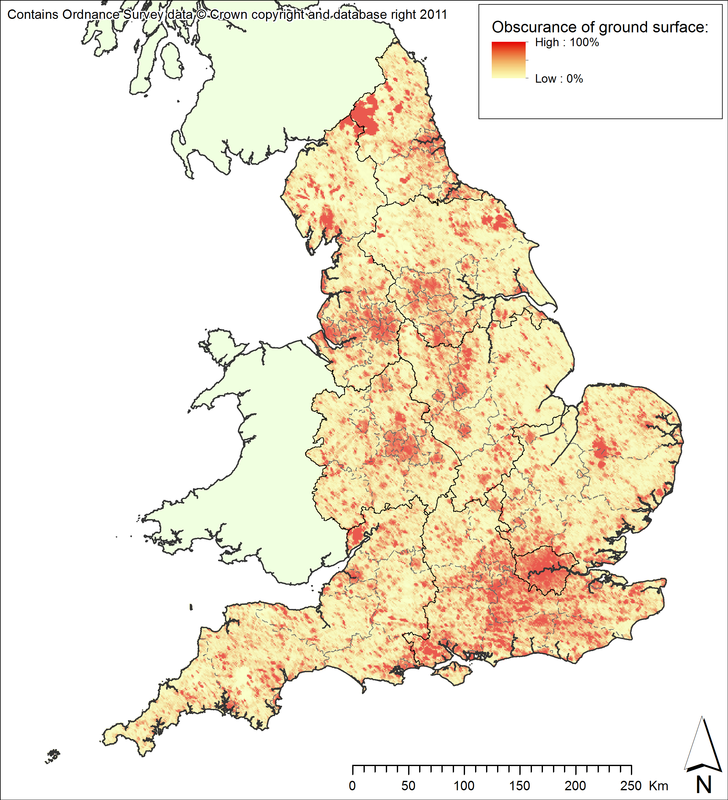 It does, however, provide a good basis for quantifying the extent to which gaps in aerial prospection results for England have resulted from the impossibility of achieving results through that method. In the context of this project, this is particularly relevant when dealing with English Heritage’s National Mapping Program data, as this was constructed on the basis of aerial survey. * This division into regions was purely to ease the processing burden on ArcGIS and my computer.